Topsham (i) – hand water coloured drypoint print – edition sold out. Topsham (i) – limited edition hand water coloured drypoint print. 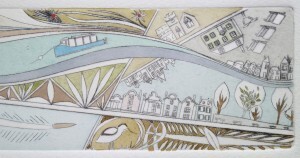 A landscape of Topsham with features including seine fishing, River Exe, sailing, Goat Walk, avocet, ferry, Dutch Houses, railway, the Lighter and Quay and more.